The following story was originally published on MIapprenticeship.org and written by a collaboration of WIN staff. Click here to view the story on MIApprenticeship.org. The term “mechatronics” originated in the early 1970s, representing occupations combining “mechanics” and “electronics.” Though more than four decades since its first appearance, the evolutionary nature of “mechatronics” makes the concept anything but antiquated. Just as technology has advanced, so has “mechatronics,” covering a multidisciplinary field of science including a combination of mechanical engineering, electronics, computer engineering, telecommunications engineering, systems engineering, and control engineering. And for companies banking on advanced manufacturing, mechatronics is a skill set very much in demand though talent is in short supply. To address the talent shortage sooner, partnerships among high schools, higher education providers, workforce partners, unions, workforce agencies and others are focusing on developing talent pipelines through dedicated curriculum and hands-on experience before individuals have completed high school, with dual-enrollment opportunities, essentially front-loading their apprenticeship opportunities. One such example, the Multi-Skilled Manufacturing Maintenance (Mechatronics) Program, was launched by Advance Michigan Center for Apprenticeship Innovation (AMCAI) partner Henry Ford College (HFC), the Downriver Career Technical Consortium, Ford Motor Company and United Auto Workers – Ford, with support from the State of Michigan, Southeast Michigan Community Alliance (SEMCA), and Wayne County Regional Education Service Agency. AMCAI, a $4 million grant from the U.S. Department of Labor, is tasked with expanding regional apprenticeship through innovation. Nine different school districts from Wayne and Monroe counties participate: Airport, Flat Rock, Gibralter, Grosse Ile, Huron, Riverview, Southgate, Trenton and Woodhaven. The program combines college courses from HFC with an instructional lab for hands-on experience at the Ford Motor Company Flat Rock Assembly Plant. The two-year program is offered to students beginning in their junior year, at no cost to them or their parents. This combination of classroom and laboratory exposure features principles and skills vital to modern manufacturing: electrical, mechanical, fluid (hydraulics & pneumatics), computer control and automation/robotics systems. In the lab setting, students learn from HFC Adjunct Professor John Nasarzewski, UAW skilled trades members and Ford technicians. As part of the program, students also are introduced to companies offering apprenticeship opportunities. At the conclusion of the two years, students who successfully finish the program complete up to 28 hours of undergraduate credits in HFC’s Multi-Skilled Manufacturing associate’s degree. In this “front-loaded” apprenticeship model, each student has the potential to be accepted into apprenticeship programs directly following high school having completed one of the three years of the related technical instruction (RTI) portion of the apprenticeship. The model puts them at a direct advantage to completing the apprenticeship requirements within the company to earn a full-time position. Many, if not most, of participating students enter into apprenticeship with the Michigan Advanced Technician Training Program (MAT2), run by the State of Michigan. Many others are hired as apprentices at companies like Brose, Link Engineering, US Steel and ZF. The need for skilled workers has prompted promising emerging opportunities for students in Michigan. 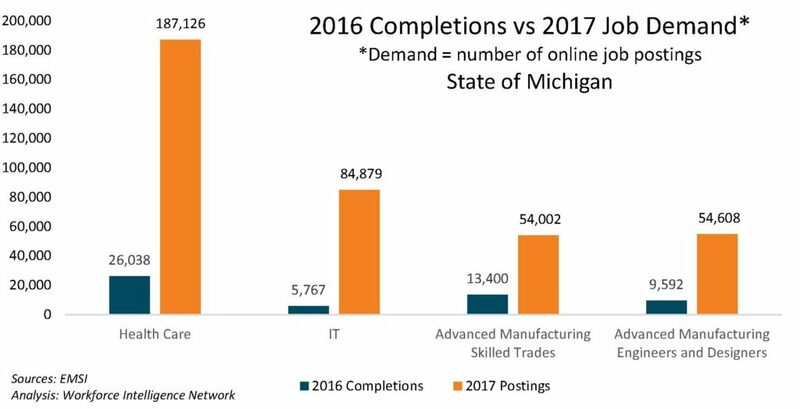 Apprenticeship will continue to be a necessity to address the skills gap as quickly as possible for Michigan to be remain competitive on the national and world stages. For more information about launching an apprenticeship as an employer or gaining additional insight about apprenticeship as a potential candidate, visit miapprenticeship.org. Those who are interested in the MAT2 mechatronics apprenticeship should visit https://www.mitalent.org/mat2.